Thanks to Asia, and in particular Japan, the world is full of cherry blossoms. DC, Sweden, Australia, Germany, the UK and even Canada all boast flowering displays not to be missed. But for some reason Paris never really comes up in the global cherry blossom conversation. As it turns out though, Paris is actually one of the best places in the world to see cherry blossoms. There are two surefire signs that Spring has arrived in Paris. The Wallace Fountains start to stream delicious eau potable again and the cherry blossoms bloom. When we first arrived in Paris, we were grossly unprepared for viewing all the cherry blossoms going off around us. We would excitedly see on the Twitter or Instagrams some recent post expounding on the glorious wonders of a particular tree in a particular location only to rush out there and find ourselves staring at some flaccidly wilted leaves as a few remnants of fallen pink petals sadly blew around our feet. Since then we have devoted pretty much all of the end of March and beginning of April to hunting down les cerisiers fleuris de Paris. Unlike in the mecca of cherry blossoms, where a helpful Cherry Blossom Association has created a list of Japan’s Top 100 Cherry Blossom Spots, there is little online about Paris’ offerings. While we don’t have 100 places to suggest (yet), here are some of the best places in and around the city to have your mind blown by the colorful beauty of these Spring bombs. A fan-favorite to see cherry blossoms is by the Eiffel Tower for the sole reason that they are by the Eiffel Tower. There are no large groupings here, rather the trees are scattered along the lengthy stretch of greenspace that spans between the base of the Eiffel Tower and the École Militaire. The best of these is probably the tree at the corner of Avenue Gustave Eiffel and Allée Adrienne Lecouvreur. A quick scan of the area will reveal several others nearby. Beneath one of these trees is the perfect place to take part in Hanami, the centuries-old Japanese practice of picnicking under a blooming sakura (Japanese cherry tree). One benefit of the Eiffel Tower blossoms is that they are some of the first to bloom in Paris, usually around the last two weeks of March. They make for a nice start to the cherry blossom season. Another benefit is they continue to appear until the middle of April. One of the best groupings, if not the best, in all of Paris is found in front of Notre Dame’s south façade, surrounding what is probably one of the coolest children’s sand boxes in the world. Below one of its famous rose windows take a seat within Square Pope Saint John XXIII and be completely immersed under a canopy of fluffy pinkness while watching tiny French children eat sand. Because of its location, this is also one of the most crowded places to see cherry blossoms. For an alternatively nice view and in a far less busy area, head across the Seine and walk along its banks below Quai de Montebello. The blossoms of Notre Dame tend to bloom near the end of Paris’ cherry blossom season, during the middle of April. A far more hidden spot that creates a truly unique ambiance for cherry blossom enjoying is within the central courtyard peristyle of the Petit Palais. This highly underrated free museum, located across from its more well-known cousin the Grand Palais, has at its center a magnificently decorated garden filled with palm trees, fountains, columns, a café and, at the start of Spring, cherry blossoms. Surrounded by opulent Beaux-Arts architecture and presided over by a monumental dome from above, this small area allows its four or so cherry blossom trees to splendidly fill the space. When they are finished, their fallen petals just as pleasingly float en masse atop its several courtyard pools. These trees tend to bloom early during the last week of March. Another less visited spot also found beneath an opulent Parisienne dome is in a small area behind the Institut de France, at the end of Rue de Siene. This square, named after a French musician, is one of our favorite spots to relax and enjoy April in Paris, particularly during its second week. With stone benches shaped like books, little noise save for the occasional ringing of the Institute bell, a towering tree deemed one of the most remarkable in France, and a fountain registered as a historical monument, this tiny, easily overlooked square, packs an epic cherry blossom punch, and makes for a perfect place to contemplate some mono no aware. Rounding out our top five picks for best place to see cherry blossoms in Paris is home to quite possibly the largest tree in all the city. The Jardin des Plantes is a flower lover’s paradise and has several standalone cherry blossom trees that bloom at different times beginning the first week of April. One of special note proves that cherry blossom trees need not be pink. This white flowering Prunus Shirotae, whose name literally means “snow white” but also goes by “Mount Fuji”, is perhaps the most unique tree in Paris. Wandering through its drooping branches is like entering a cherry blossom igloo. The only thing that could top that is the gigantic tree found only a few meters away. 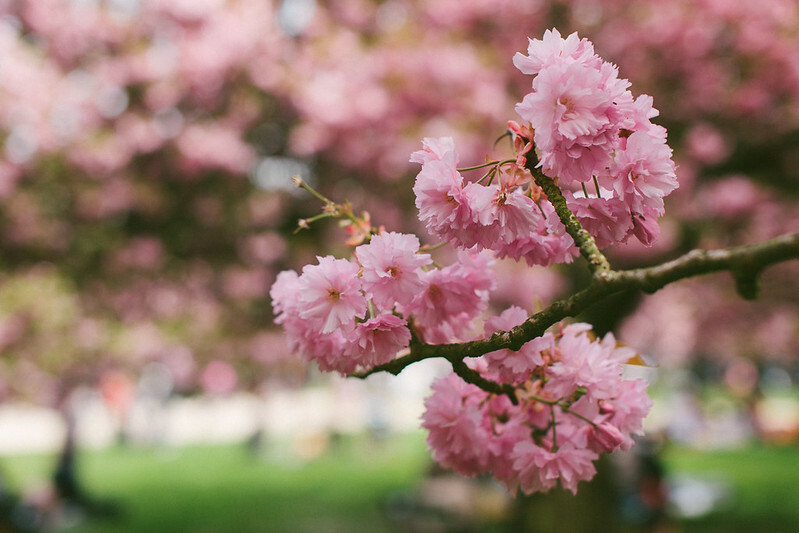 For us, this behemoth is the holy grail of cherry blossoms – our pink whale. The white igloo is the first to bloom in the garden at the very end of March or first few days of April. 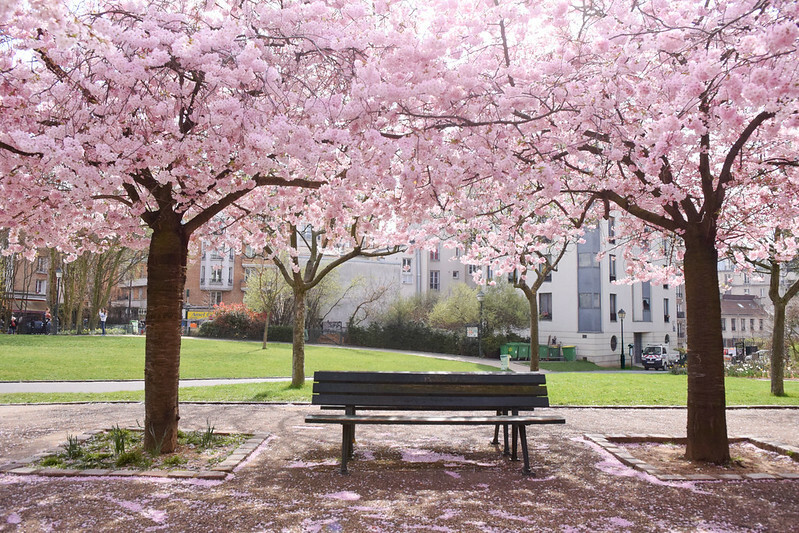 The pink giant is usually the last, going off during the third week in April, often marking a triumphant end to cherry blossom season in Paris. Across the street from Notre Dame on the Left Bank is Square René Viviani, named after the first Minister of Labor of France and once the site of a Merovingian (the first dynasty of French kings) cemetery. This little park is the site of one of the oldest, and ugliest, trees in Paris, as well as a quadrangle of cherry blossoms at each of its corners. They are some of the first to bloom during March, usually during its fourth week. Nearby stands a very nice cherry blossom tree in front of the Shakespeare and Co. bookstore, which usually blooms in the middle of April, around the same time as those at Notre Dame. Towards the end of the same road as the bookstore, Rue de la Bûcherie, there are several smaller trees. 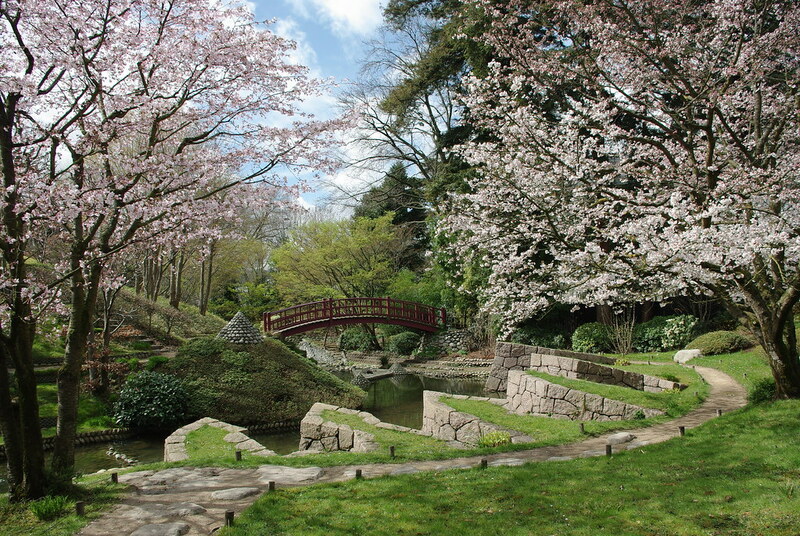 A hidden gem of the Marias is the very peaceful Jardin Anne-Frank, which is home to a large collection of cherry blossoms at the back of the park. There are a few nice trees at the beginning of the Champs Élysées by Place de la Concorde. Most notably a very large cherry blossom along Allée Marcel Proust that could give the giant in Jardin des Plantes a run for its money. A nice walk, especially if you’re visiting the Jardin des Plantes, is through Jardin Tino Rossi by Quai Saint-Bernard. Several cherry blossoms are scattered along the banks of the Seine, mostly blooming in the middle of April. A decent gathering of trees that also bloom around the middle of April are those on the terraced gardens at Place Franz Liszt in front of the Church of Saint-Vincent-de-Paul. Though this grouping is well off the normal trodden path and probably not worth a visit unless you find yourself close-by or a die-hard cherry blossomist. Even farther off the trodden path and pretty much only enjoyed by neighborhood locals are the nice grouping found way out in the 20th arrondissement within the Jardin Saint-Simonian. This garden, named after the proponent of utopian socialism Henri de Saint-Simon, is a great place for an idealistic relaxation at one of its colorfully shaded benches, usually during the first week of April. © Audrey FELIX – Et si on se promenait… à Paris ! 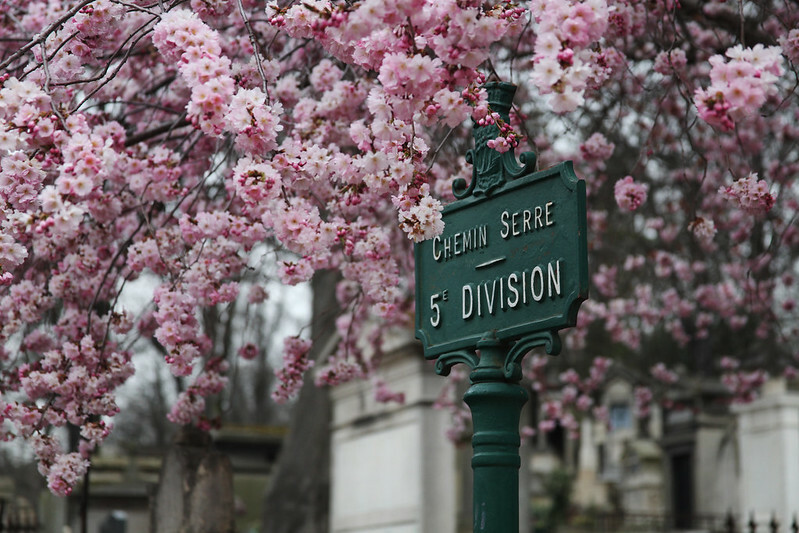 Of course there are individual trees to be found throughout the city, like the one that stands sentry within Montmartre cemetery, blooming around the middle of April, but these are probably best left to be found by chance. And although we have not had the opportunity to see them, we have heard of nice collections in other parts of the city. These include by Père Lachaise Cemetery, within the Japanese gardens at the former home of Ablert Khan (or as we like to call it mini-Giverny), the student housing of Cité International Universitaire de Paris and along the former railway turned pedestrian high line La Coulée Verte (also known as the Promenade Plantée). All these areas, along with the ones listed above, are free to access save for the gardens of Albert Khan, which are part of a museum technically in a suburb of Paris that is only free on the first Sunday of each month. There is probably no larger congregation of cherry blossoms near Paris than those at Parc de Sceaux, or as we like to call it, not-so-mini Versailles. Spanning across the municipalities of Antony and Sceaux on the grounds originally purposed for the château of Louis XIV’s Minister of Finance, this massive free-to-all garden was created by André Le Nôtre, the famed landscape architect of the Tuileries, Fontainebleau, Chantilly and Versailles. There are two areas to see the blossoms, the Bosquet Nord (north grove), where the blossoms are pink, and Bosquet Sud (south grove), where the blossoms are white. Here’s a map of the park so you see the exact locations. The trees blossom around the second or third week of April. 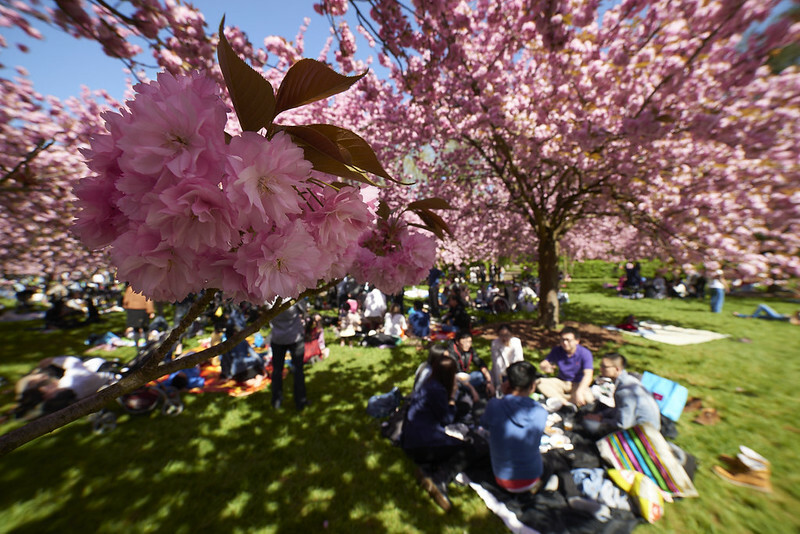 Around the second week of April the Tsungari Taiko Center holds their annual Hanami au Parc de Sceaux, which might be the closest thing you will find to a cherry blossom festival around Paris. Although it’s never guaranteed the blossoms will be out day of, the event includes traditional Japanese dance and drumming (known as Taiko) in the north grove. Competing with Parc de Sceaux for the greatest number of cherry blossom trees on-site is Disneyland Paris. One of our favorite cherry blossom experiences of the season came during a trip there, where we found the most perfect cherry blossom scene. At the exit of the Fantasyland Train Station, behind Toad Hall restaurant, is a curving path designed to showcase these Japanese exports in all their glory. While these were by the far the best, there are many other areas where they can be found: Phantom Manor, in front of the It’s A Small World ride, the paths around the Storybook Canal ride, in front of Peter Pan’s Flight and in front of the tram tour at Walt Disney Studios. They peak around the last week of March and first week of April, with a few stragglers up till the middle of April. Disclaimer: All said and done, our best-guess time estimates of when the cherry blossoms will bloom could be completely off depending on the weather. It is also important to remember while although a cherry blossom’s bloom can last up to two weeks, they are really only in full bloom for a couple of days. If you’re hoping to see cherry blossoms but repeatedly end up missing them, c’est pas grave. Like most ways of doing things in Paris, sometimes it is better to experience them as a flâneur and let the cherry blossoms find you. And if they don’t, go get some wine instead. For those of you who have ever stared up in awe at a cherry blossom tree and said, “I wish I could eat you”, you’re in luck because over at Ladurée you can try one of their cherry blossom flavored macaroons. This may be a safer bet than eating the petals right off the tree, though who’s to say because they sure do smell great. Lastly, if you know of any areas in Paris that we missed please let us know so we can help make this guide as definitively awesome as possible. The Most Perfect Spot in All the Tuileries Easter in Paris Paris Palm Trees Those Buildings. It will be the tail end of the season. The blossoms are out at Notre Dame and will probably be gone the end of next week. If you’re in Paris at the end of April your best bet is seeing the giant tree at Jardin de Plantes. This is a wonderful and helpful post! I found a sweet little group of flowering cherries in North Paris near Pigelle. There were six or seven smaller trees. I’ll try to attach a photo of the square, they are not quite in full bloom March 21st. PS your photos are lovely! Thank you so much! So glad you liked the post. And thanks for sharing your photos. What a great find! I didn’t even know this square existed. Looks like its on rue de Calais. Will definitely have to check it out. Oh wow!! Thankyou so much for writing this comprehensive guide! I will be in Paris the last week of March and I am now so excited for the fact that I might see some cherry blossoms. I will be taking this guide with me to track them down! We’re so happy you liked it! Since this Winter has been a bit warmer in Paris some of the trees from April might even bloom early. Have a great trip! Let us know if you find any new ones. Happy Blossom Hunting!